A clean and organised desk not only looks good, it helps with peace of mind (you can always do the downward dog if you prefer!) and also your productivity, by cutting the amount of time you spend searching for things. It also lets other people know that you’re an organised individual – which can be handy if you’re supposed to be managing them or you’ve got people you want to impress (if you’re working from home you can give yourself a pat on the back). 1. Get rid of those pens that no longer work. Chances are you’ve got a biro or two (or 50!) on your desk that don’t really work. Rather than waiting for the day they magically start working again just bin them. Don’t you feel better knowing that when you pick up a pen it’ll actually write now? 2. Throw away your post-it notes. Stop spending time trying to get post-it notes to stick to things and keep any important notes in a notebook. 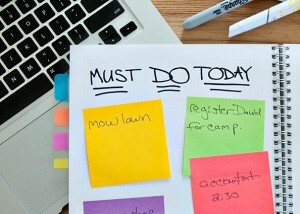 With instant messengers, synchronised calendars, and a huge selection of note apps available for desktop and mobile devices, it’s time to ask yourself whether you really need post-it notes to remind you about things. 3. Stop eating at your desk. When you’re pressed for time it’s tempting to shovel in food as quickly as possible while simultaneously responding to that urgent email, but for the sake of your desk (and your colleagues) please don’t. You won’t have to contend with crumbs in between your keyboard keys, bits of food debris all over your documents, or sauces making your work surface sticky. If you can’t give up your desk snacking, at least have some wet wipes to hand to clean your desk (and fingers) once you’re done. 4. Stop printing things that don’t need to be printed. Printing less cuts costs, helps the environment and, best of all, reduces the amount of paperwork that ends up on your desk, saving you both space and time. 6. Position your coaster carefully. Just make sure you minimise the chance of knocking over the drink on your coaster by positioning it away from your mouse or phone. You don’t want to be ‘that’ person! 7. Remove things you don’t use regularly. Sticky tape dispenser, stapler, scissors, lamp or that old school tape player … our desks are full of things we rarely if ever use. If you’re not using something on a regular basis free up some space by storing it in a cupboard somewhere and fetch it when you need it. 8. Go wireless where possible. Wireless mice and keyboards are relatively inexpensive these days, so even if you can’t convince your employer to free you from wires there’s no reason why you can’t enjoy the visual delight or a wire-free desk. Studies have shown that having a plant at your desk can reduce stress, increase productivity and even improve air quality – so this is definitely one desk item that shouldn’t be considered clutter. Just make sure you have a suitable planter that isn’t brimming with soil and keep dead leaves off your desk by giving it the occasional trim…and don’t forget to water your new plant too (and name it)! Of course, it isn’t always possible to go wireless. Invest in a cable tidy to stop wires from tangling and label your cords now to save time in the future and prevent you accidentally pulling the plug on your computer because you want to charge your phone. 11. Set time at the end of the day to make sure your desk is tidy. You’ll thank yourself in the morning when you turn up to work and discover a desk that is clean, tidy and ready for the day ahead. Particularly useful for people that have a mountain of things in their drawers, you can buy dividers for drawers of all shapes and sizes. Or you can easily make your own with some cardboard. 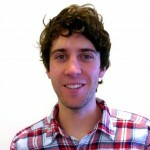 Dan Sharp works for Hassle.com, which matches busy people with local, trusted cleaners. It helps busy working professionals to free up their time to do the things that matter most in life. Hassle.com operates in London, Leeds, Manchester, Birmingham and Dublin.